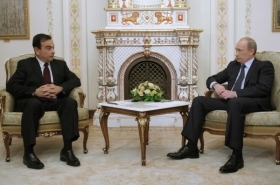 Russian Prime Minister Vladimir Putin, right, has said a reluctant Ghosn, left, should let Renault take a controlling stake in strugggling AvtoVAZ. Such an invitation "cannot be ignored," says one analyst. PARIS (Bloomberg) -- Carlos Ghosn's negotiations to take control of AvtoVAZ may be the Renault-Nissan alliance's final opportunity to grab the leading position in one of the four largest growth markets. Ghosn, who heads Renault SA and Nissan Motor Co., needs Russia because mature markets are stagnating and the remaining three biggest emerging markets already have dominant overseas carmakers. Volkswagen AG is the biggest in China, Fiat S.p.A. is largest in Brazil and Suzuki Motor Corp. leads in India. The CEO estimates Russian auto sales will reach 4 million by 2015 and he aims for 40 percent of those deliveries by taking over AvtoVAZ and expanding production by 700,000 vehicles. Nine-month sales gained 18 percent to 1.32 million, according to data from the country's Association of European Businesses. Renault-Nissan is in talks with Moscow brokerage Troika Dialog and state-owned Russian Technologies Corp., which each hold 25 percent of AvtoVAZ, to take a controlling stake in Russia's largest carmaker at the urging of Russian Prime Minister Vladimir Putin, Ghosn said this week. Renault-Nissan currently owns 25 percent, valued at 12.4 billion rubles ($410 million) at yesterday's close. The Russian auto market, after plunging 50 percent last year, is recovering with the help of government incentives and may overtake Germany to become Europe's biggest by 2015, analysts predict. Renault-Nissan is in pole position to harness that growth in tandem with AvtoVAZ, whose Lada badge adorns one in every four cars sold in Russia today. France-based Renault's plan to dominate Russian sales after receiving the government's blessing follows a playbook rivals used to gain leading footprints in other emerging markets. Germany-based VW owes its lead in China to a successful encounter with a visiting Chinese delegation in the 1970s, said Christoph Stuermer, a Frankfurt-based analyst at IHS Automotive. Europe's biggest carmaker now claims more than 11 percent of Chinese vehicle sales, according to IHS data. Suzuki, once invited to rescue Indian carmaker Maruti, now dominates that market with a 36 percent share. Renault plant investments in Brazil and Argentina have not loosened Fiat's grip on the Latin American market, with a 24 percent market share, compared with less than 5 percent for Renault-Nissan, according to IHS. The alliance is the sixth- biggest carmaker in China and 10th largest in India. AvtoVAZ leads the Russian market with a 28 percent share, while Renault-Nissan has 9 percent. Ghosn's potential empire would have a commanding 37 percent of sales. Renault and its 43 percent-owned Japanese affiliate are already upgrading AvtoVAZ's sprawling Togliatti plant with a new production line that will raise capacity to 900,000 cars and begin assembling a new Lada model in 2012, based on Renault's no-frills Logan range. Renault and Nissan vehicles will follow later that year. The AvtoVAZ revamp “could easily deliver operating margins in excess of 10 percent” on revenue of 5.2 billion euros ($7.4 billion), lifting Renault's earnings by 50 cents per share on the basis of its current 25 percent stake, Warburton estimated. The investment also brings risks, as Renault pushes to improve efficiency at AvtoVAZ. The French carmaker's managers were marginalized once before, until the sales collapse led to the ouster of its last Russian CEO. Russia's sales subsidies may also mask AvtoVAZ's urgent need for new models across the board. Ghosn until recently resisted Putin's calls to increase the AvtoVAZ stake Renault bought for $1 billion in 2008. Instead of providing more cash, the French carmaker contributed equipment and technology worth more than $300 million. Renault also declined to raise its holding even as the Russian government injected 40 billion rubles ($1.3 billion) into AvtoVAZ to pay off debt accrued during the 2009 crisis. Renault spokeswoman Axelle de Ladonchamps declined to comment on the details of the negotiations. French daily Liberation reported Nov. 2 that Russia threatened to dilute Renault's existing stake unless Ghosn bought a bigger holding. Most of AvtoVAZ's crisis debt is held by Moscow in the form of notes that can be converted into stock. The proposal to raise the alliance's holding to 50 percent plus one share came from Putin, Ghosn said after talks between the two men in Moscow this week.